The forum was standing room only and the tone was one of support and unity. Student, administrative and community speakers each denounced hate, bigotry and anti-Semitism and asked their community to step up and do more to support students, the school and each other as these issues are addressed. Sadly, the student speakers shared that this is not the first time they have experienced anti-Semitism in their community and wondered out loud how these images can continue to resurface in 2019. Rabbi Mintz of the Chabad Center also shared that a study conducted last year by the Conference on Jewish Material Claims Against Germany reported that 41 percent of Americans and 66 percent of millennials say they don’t know about the Auschwitz death camp where more than a million Jews and others – including Poles, Roma people, and gay people – were executed. Forty-one percent of millennials believe 2 million or fewer Jews were killed in the Holocaust. It was 6 million. And 22 percent of millennials say they haven’t even heard of the Holocaust. We cannot forget these histories. This incident highlights the importance of education and the need to learn the many histories of the different people who make up this country. With hate crimes in Orange County on the rise, it seems more important than ever that we break down the barriers that keep us from understanding each other and start building the connections from which empathy grows. 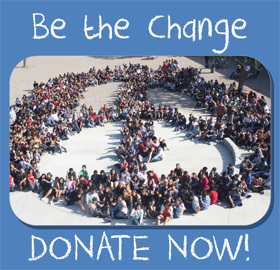 OC Human Relations is committed to supporting Newport Harbor High School and the Newport Mesa community through our BRIDGES: Safe and Respectful Schools Program. We will be there to work on long term solutions. 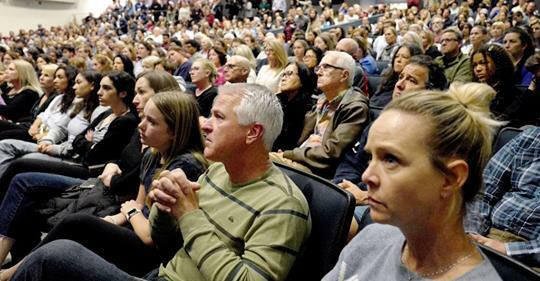 As Principal Boulton said yesterday, “we can’t do it alone,” but hopefully the hundreds of people who came to the forum last night will prove to be a powerful start.